If you know me, even a little bit, you probably know that I am a huge fan of the Marvel Cinematic Universe. In fact, I'm a full-on MCU fangirl. But I've still never read a Marvel comic book, until now. 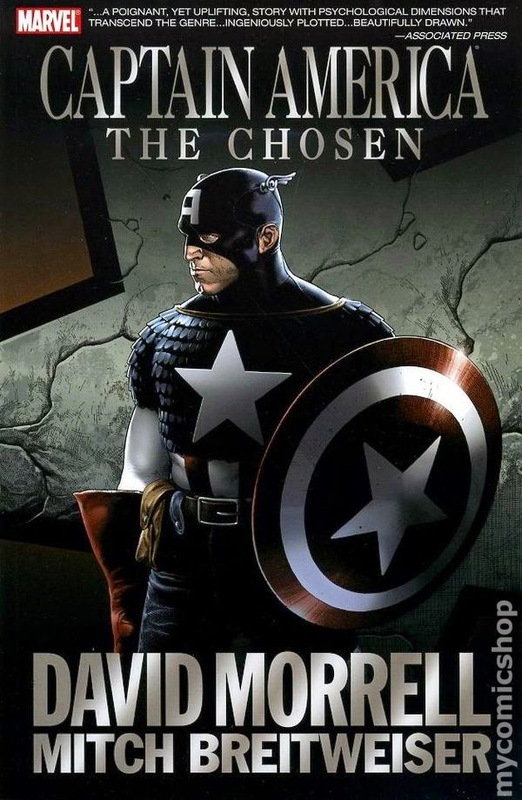 I randomly picked a few Marvel comic books at the library, choosing based on title, look and plot, and the first one I delved into was Captain America - The Chosen. Captain America lies dying in a bunker in Washington D.C. while in Afghanistan a young soldier, Corporal James Newman, is bone tired, missing his wife and baby, and ready to give up. When his convoy gets involved in a battle in an Afghan village, Newman is helped by Captain America. Or is he? As a first comic book, I think this was a pretty good one. The first thing I noticed (obviously) were Mitch Breitweiser's gorgeous illustrations, and the colouring of the whole series. Set primarily in battle-scarred Afghanistan, there's a real sense of the way the colour is leached out of Newman's world in every panel. Everyone and everything is brown and yellow, covered in dust; even the American flag in the first panels of the first chapter is seen through a haze of sand. When Captain America appears on the scene, that's when the first hints of colour appear. That gorgeous red, white and blue associated with every iteration of Captain America breaks through the browns, and also adds a slightly unreal element to the story, mirroring Newman's position - is what he's seeing, Captain America in the Afghan desert, too hyper real to be true? David Morrell's words and story back up the beautiful images, and introduce us to not just Newman, the Afghan war, and conflict in general, but also retell Captain America's backstory - briefly enough for those familiar with it, but with enough detail for those not so familiar (it's slightly different from the MCU, so I count myself in the latter group). We also get a secondary plot, which plays out from the beginning of the book but is almost overwhelmed by Newman's story. That secondary story, involving the dying Captain America, is clearly inserted as a means to an end, and I'd perhaps have liked to have seen more subtlety in its execution, which was a bit obvious towards the end. I loved the stuff in The Chosen about loneliness and loss, both in Captain America's life and in Newman's (where the loss was a possibility, but was also about his mental state, as well as physical loss). It did get a little sugary at times - Captain America is a great superhero, but he's also super sincere and very, very good, which has the potential to turn cheesy sometimes. Morrell manages to get away from that for much of The Chosen, but there is an element of cheesiness here, particularly in the last few pages, where it gets a bit much. However, it mostly works, but only because of the bleakness of the rest of the story. This comic book is clearly Marvel's response to the 9/11 terrorist attacks on New York and the ensuing wars, but I'm not sure we needed to see Osama Bin Laden's face on the pages - a little too obvious, but perhaps that blurring of reality and fiction is what Marvel were after. Captain America is the stuff of comic book legend, but The Chosen really shows his human side. In spite of its imperfections, I loved it as my introduction to the comic book world of Captain America, as it's both a superhero story and a very human story. And at its core, it's pure Captain America, all about sacrifice for the greater good.